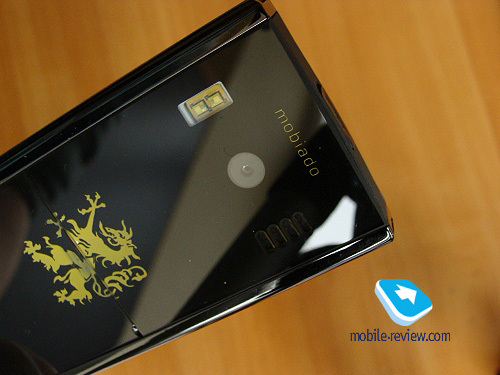 First, a few words about Mobiado, a Canadian company specializing in redesign of current Nokia models. 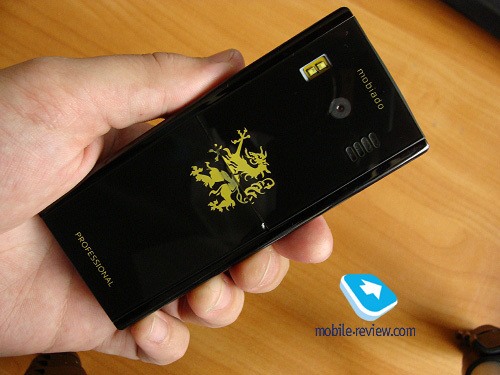 Unlike Vertu (100% Nokia’s subsidiary), Mobiado is an independent manufacturer whose phones are sold on a very limited number of markets – only 13 counties to be exact. According to the information on their official page, the strongest representative office is located in Russia, its might based on the partnership with the largest Russian retailer - Euroset. 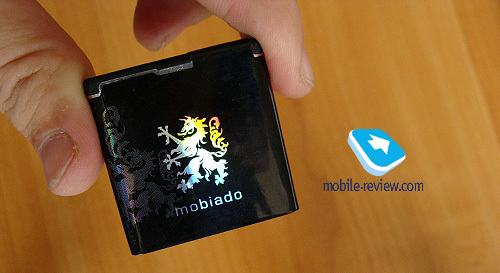 It is due to the efforts of this retailer that Mobiado brand is entrenched on the Russian market. 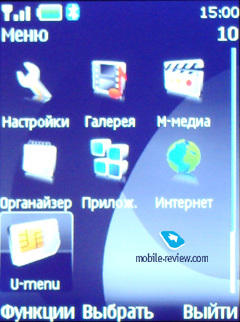 The underlying reason for this close cooperation is the war with Nokia Euroset was engaged in between 2006 and 2009. Then the retailer refused to sell Nokia products, including Vertu, but it did not want to lose the ultra luxury phones market niche. Because of this we now have an established luxury brand Mobiado, maybe less known as Vertu, but with a distinguished design and the highest profit margin. In other words, all conditions necessary for fake phones demand were created and Chinese craftsmen got down to business. The handset comes in a candybar form factor. 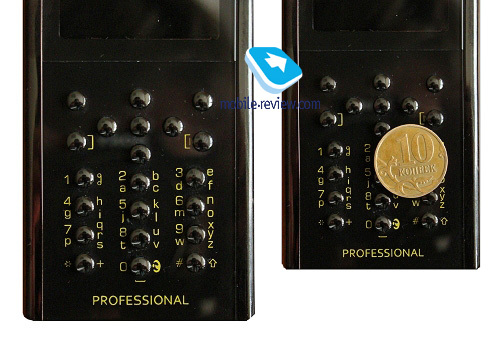 The fake 105EM measurs 108x45x10 mm and weigns 162 g. When quickly comparing the original device and its clone it is difficult to destinguish between them. The differences are noticeable in the way inscriptions are performed - gilding differs from yellow paint somewhat. But the main attributes and details of the “maternal” model are replicated extremely meticuliusly. The clone inhereted tempered glass on the front and rear, trademark Mobiado round buttons and wood on the sides. 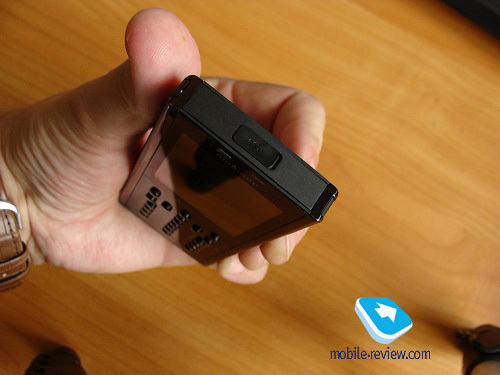 That is the first thing fifferentiating Mobiado’s clones from those of Vertu. To guess a fake in the former is much easier. The fakes of the two brands can be regarded as antogonists: extravagant Vertu design vs. Mobiado emphasized understatement. Jumping the gun I would say that comparisons won’t be in Vertu’s favor. Mobiado Professional family handsets have controls located on the front, making all other sides clear of them, except for the upper edge occupied by the Chinese microUSB slot for charging and connection of the headphones. The back houses the camera lens, external speaker and LED flash. Battery cover is made of glass just like the other two surfaces. My particular phone was chipped and had a painting defect in the back, result of transportation from China. This information is for those guys on the Forum that were trying to convince me that ordering a handset directly from China will be twice as cheap. There is nothing to argue about. There are eBay and other internet sources, but no one will guarantee you anything. You can’t return the defective merchandise. Your risks are your risks. The Ebony’s keypad I absolutely identical to the original one. 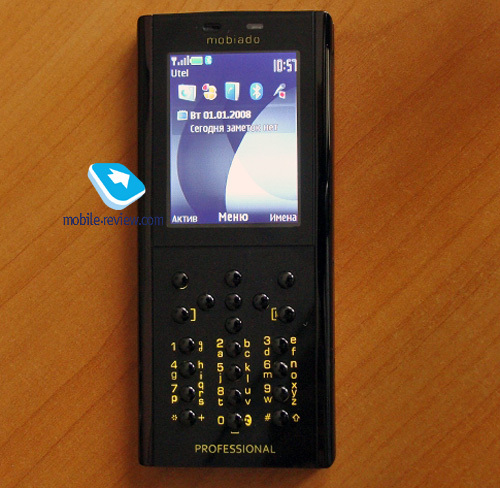 It is presented by 20 round keys which the trademark feature of all Mobiado phones. The keys are a pleasure to use; wrong press is a rarity. The keypad itself doesn’t require much time to get used to. The only thing to mention: the keys are loose in their places. This doesn’t affect functionality, but while carrying the handset in the pocket you hear the keys rattling. I was not really annoyed with this sound, but someone may hate it. 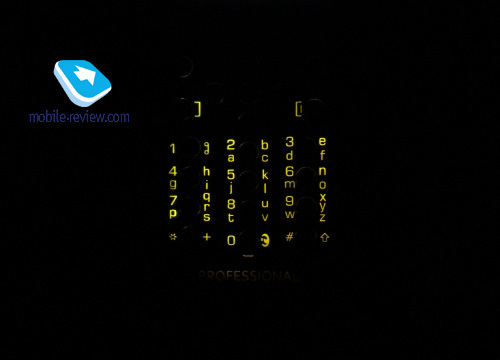 Keypad is brightly lit in yellow. Using the handset at night will cause you no troubles. 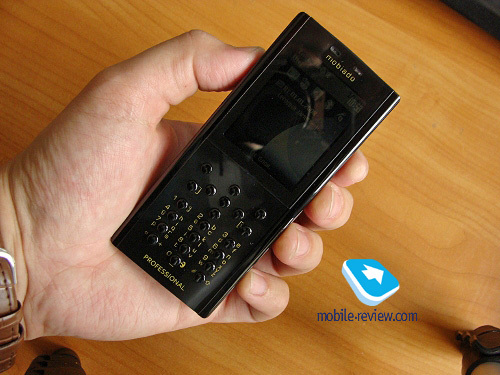 Ebony’s keypad is functional and pleasant unlike that of Vertu Ferrari replica – using it was a real torture for me. The battery cover hides a SIM card slot and the battery itself. 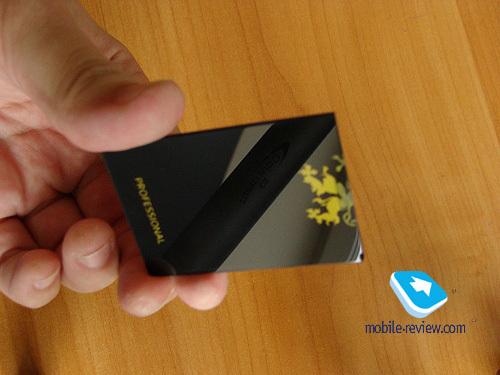 The Ebony utilizes 830 mAh Li-ion Mobiado battery. The second battery is included in the sales package. 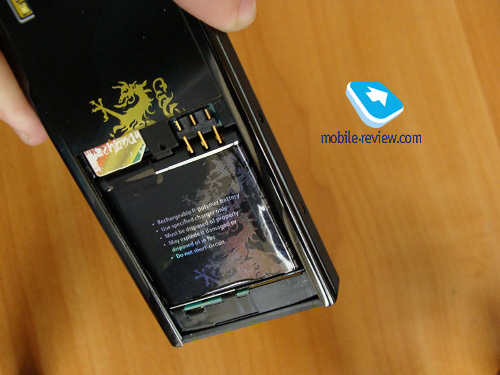 In fact, it is a standard Nokia BL-6P battery. The manufcturer claims the battery is able power the device for up to 216 hours in standby and for up to 4 hours in talk mode. During tests the 105EM worked an average 2 days with an hour of talk per day and up to 30 minutes of Opera Mini use. The lack of screen brightness adjustment significantly affects the battery life. It takes the handset about 2 hours to charge from to full. The 105EM can be charged via laptop data-cable, but the quality of Chinese jacks and connectors leaves much to be desired. Often you have to spend some time to find a particular position to get things going. To charge the battery on the go you can use USB slot on the radio or a cigarette lighter in the car. There is no microSD memory card slot. 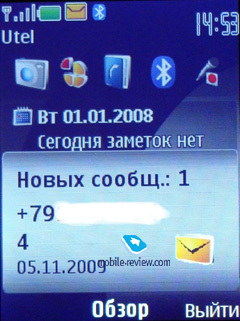 920Mb of built-in memory are availablr for a user. 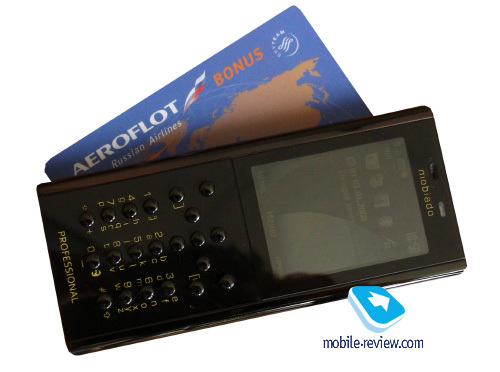 Mobiado Professional 105EM Ebony uses TFT matrix LCD screen with QWGA (240x320 pixels) resolution, capable of depicting up to 16 million colors. The display is bright, I would say superfluously bright which increases image juiciness, but devours battery charge. Does it remind you of anything? This approach is not typical for the Chinese engineers, who have always made the number of days the device would work a priority. All that is explained by the fact that clone’s internal ordans were designed not in PRC, but in a small town of Espoo, a suburb of Helsinki, where Nokia’s headquarters are located. 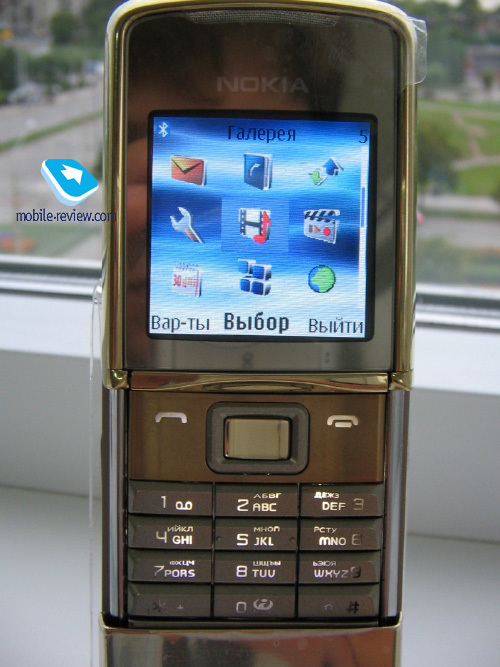 The phone is based on original Nokia 6500 Classic board manufactured in China. Inside the 105EM has original S40 5th edition platform. Nokia 905, the wireless stereo headset 105EM comes with, works, but not long and badly, consider it nothing more but a bonus. The wired headset is not different. Those who are interested in the phone’s other specifications I’d like to refer to the corresponding material as I see no reason to rewrite the already published review of Nokia 6500 Classic. Inside the phones are absolutely identical, except for microUSB slot. It is difficult to add something about technical side. There is nothing new in this way of replica production. 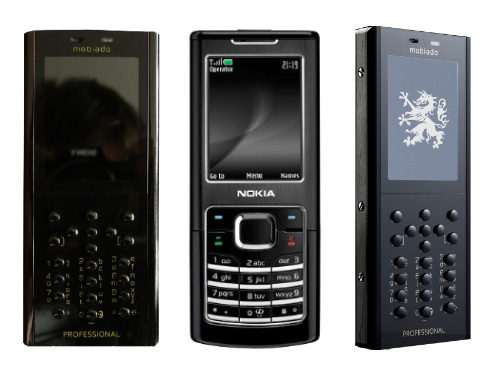 For a while now all kinds of fake Nokia 8800 variations exist on the market, based on Nokia 5310 Xpress Music internals. 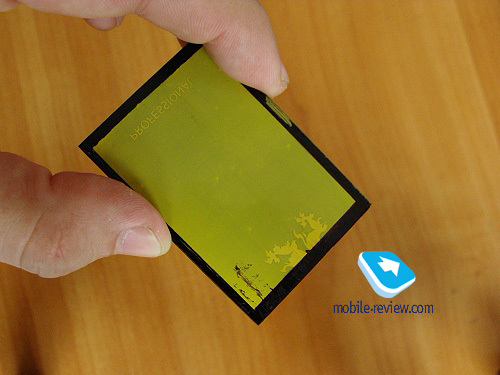 Due to their thinness these boards (6500 Classic and 5310XM) are widely used by the Chinese manufacturers. Just how exactly Chinese masters of counterfeite manage to get these boards is a dark secret, but these fakes are mass manufactured, so there are two simple explanations: a) PRC based Nokia factories work three shifts instead of two and sold the boards under the table by a railroad car or b) In 2007-2008 the Finnish giant encountered serious problems with production cost accounting in China. Now we can no longer find the fakes based on the 6700 boards – aperantly the problem with component leaks seems to be solved. Let’s return to Mobiado. At the end we have a fake that is different from the original only by the lack of special menu themes and, of course, such design materials as cocobolo wood, 24-carat gold, high grade steel and sapphire glass are replaced with surrogates. 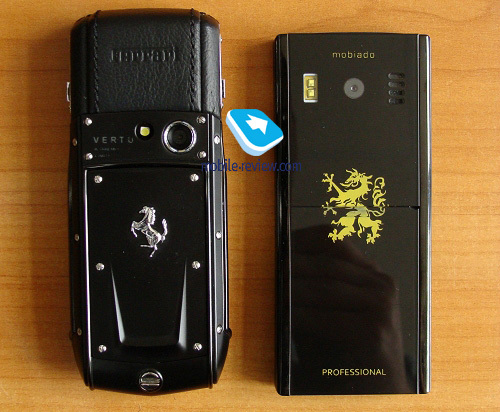 All that taken together makes Mobiado Professional 105EM Ebony a much better quality fake (in every aspect) than Vertu Ferrari. It is an incomparably more interesting purchase. 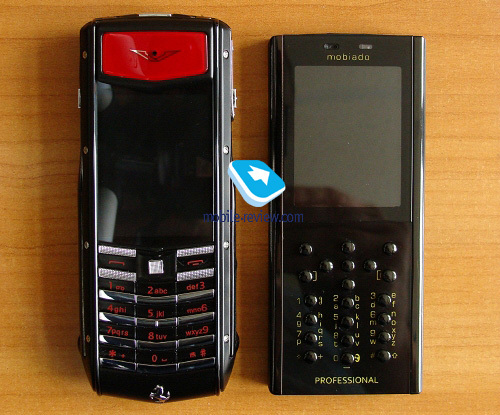 Partially, because this handset creates a larger Wow effect than Vertu. You can take Vertu Ferrari out of your pocket to show off, but under no circumstances you can give it to other people not to be exposed. For instance, as a wallpaper my Vertu Ferrari had a picture of Lamborghini Gallardo. Profit! The Chinese see no difference between European brands. On the other hand, with Mobiado Professional 105EM Ebony you can safely give it to anybody to play with and get total approval. 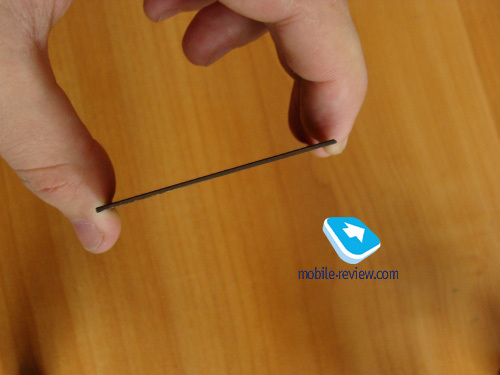 Generally speaking, the main advantage of the phone is that you won’t feel ashamed taking it out of the pocket. It has none of cheap fake kitsch and decently copes with all tasks, managing to be a not too expensive phone and a bling to show off at the same time. With all that, Vertu fakes have one undisputable advantage over those of Mobiado – utility. 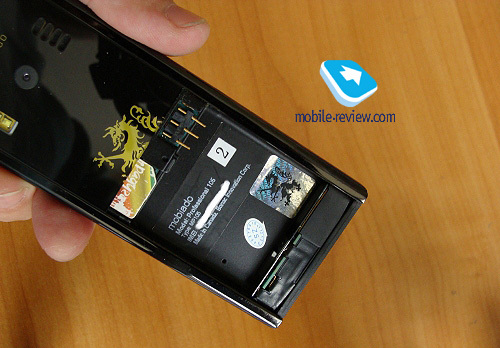 Vertu is a kind of go anywhere rover you can put into your pocket together with keys, throw on the floor. In emergency situations it can be used as a set of knuckles or another heavy blunt object. And nothing will happen to it. The 105EM Ebony, on contrary, requires very tender handling. The phone is elegant and fragile; there is no place for brute force there. Besides, the phone requires permanent care. Any touch leaves the ridge patterns that are not easy to remove. While using I wrapped it in a velvet cloth that was also used to wipe the phone clean. That has a certain touch of nobility the fake inherited from the original. The majority of costly accessories require constant attention from their owners. Mobiado should be wiped, Longines should be winded, Yorkshire terrier should be brushed, Porsche should be washed, repaired and filled with petrol. The opportunity to join the world of C. C. Capwell and Donald Tramp costs 270 Euro. That is the price in Mobilike that was kind to give me the handset for testing. For advanced forum fans I would say that Internet is full of inexpensive offers. To sum up the phone is worth the money. It is significantly better than fakes of Vertu, Blackberry or iPhone. People not familiar with handset market told me that they would buy this phone if they saw it on a shelf of a local store. But… There is only one “but” that should prevent you from purchasing the 105EM Ebony - anyway no one will believe that you have a real Mobiado! The rest is self deception. 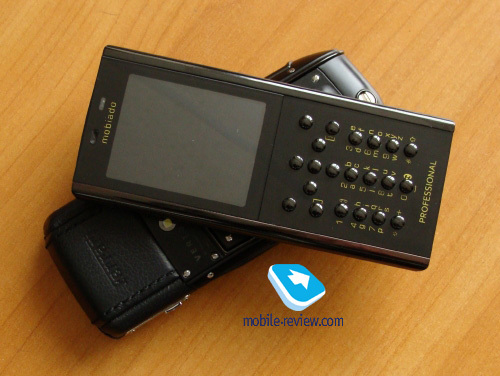 The author thanks Mobilike.ru for providing the fake Mobiado Professional 105EM Ebony Plus for testing.